Drama. An enterprise can grow “horizontally” by acquiring or “absorbing” its competitors, and “vertically” by acquiring its “suppliers” (upstream) and possibly its customers (downstream) who are held in its “thrall” or necessity, so that it could end up “producing by itself for itself”, which is the “goal” and signature of a sovereign state (The Daily Mail, October 13, 2014, The iPhone ruined my country’s economy: Finnish prime minister). A government which is a sovereign state – not to consider corporations – fails to be the “One World” (producing by itself for itself) as long as it has “suppliers” and, therefore, payables (P); or if it has “customers” for which it has receivables (R), and we describe them both as (P) “what the government (sovereign state) owes” and (R) “what is owed to the government” outside of itself. Inside of itself, however, where it is expected to govern, it will tend to have the Company D modality (please see below), and it will always be in debt to its people, but it cannot be insolvent, or bankrupt, inside of itself (no matter how bad the situation is for its people) and it has only to deal with the payables outside of itself, and those are acquired and dealt with in trade with other sovereign states. If a government has only payables, and no or negligible receivables, then we would expect that it would eventually disappear, having “paid itself out”; and if it has only receivables, then its customers will have only payables and they too must eventually “pay themselves out” and disappear. And in either case, we are left with an “entity” that has no relations outside of itself, neither payables nor receivables that would be due to something outside of itself, and the question is, can such an entity exist? And if not, why not; and if it can, what does it look like? 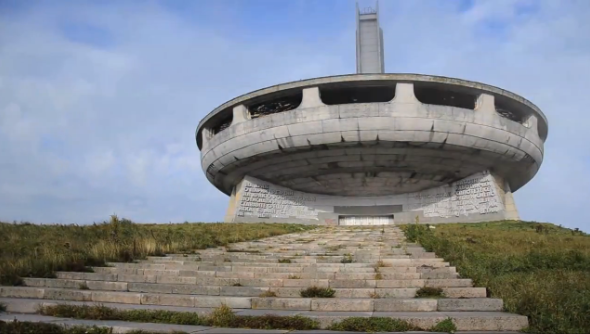 Buzludzha, Bulgaria – it was a Congress of sorts and cost millions, of lives. But it’s not a hard question to answer because we already know the answer – we have just the “One World”, our world, and it exists as such because, and only because, we have “Global Trade” and countries that can not compete, or will not compete, or are excluded in global trade, will always wither and die at great expense to its people. The state of payables that are vastly in excess of receivables is entirely described by its modality, α=R/P, that is as close to zero as it might be, but for which many of its properties begin to emerge at α<1/e=0.368… which is the Company D modality which we call the “Death Embrace” (please see below), and it is a “low entropy” state – death by freezing, so to speak, and inhabited by the “economically frozen”. As a less mordant example, the Canadian REITS are all of extraordinarily low entropy (which is the modality) and typify the “kindness” – we let them (our customers) live – but “unkind” economics of “servitude” (to “rent”, in this case) in that region of vastly more payables than receivables. Having said that, of course, the Canadian REITS are an attractive investment to those who own them (and don’t have to live in them) and a substantial benefit to the bondholders, so that, in fact, there is trade and the REITS are in the business of constantly maintaining and renewing their assets while taking rents as income, which is not unlike what governments do. Moreover, it is not just low modalities that are a “problem” for both the payers and the payees; for example, the Microsoft Corporation has a modality of α=2.28, and Apple Incorporated, α=2.17, and entire industries have sprung-up to compete with them for their markets, and with just cause and opportunity, because both of these companies provide “defective or deficient products” for which their customers (the payers) have little defense but to go elsewhere. If it has only receivables and negligible payables, then the entropy becomes high and its properties already begin to emerge if α>e = 2.71828… and those are the properties of the dreaded “heat death” at the end of time, which could arrive a lot sooner if we just make everything look the same, and lots of people have tried to do that with this “ism” or that “ism”, and that world is inhabited by those who have no use for “economics” while they still have the means, and we are used to frantic investors looking for income. But we don’t have either of these “One Worlds” today, and we have never had them for long, but there have always been camps on both sides of it, some armed only with “swords”, others armed only with “pens”, and a few that have both but will surely lose both if they pursue the “One World” with their swords, and then with their pens which come-up empty, as affected the Romans, and the Babylonians before them, and the Persians after them, and every “empire” that we have ever seen. The Entropy Law has come to be understood as an “iron law” – with it, we exist, without it, we don’t – and that understanding has only emerged in the last hundred years or so, and there are still lots of physicists and philosophers who are still trying to “explain it” and the physical evidence suggests that it probably does not exist exactly as such at extremely low, very near zero temperatures where there is “no motion” or “time” or even “space”, and extremely high temperatures, vastly exceeding that of the sun, where there is no rest and it is state that describes the timeless universe before the advent of time, space, and entropy; please see The Process for more information on that equation, which is an equation of hope because it explains how any “zero” may become a “one” (ibid, The Daily Mail). We have shown in the Theory of the Firm that companies form, and governments live, within “the societal standards of risk aversion and bargaining practice”, whatever those might be, at the Company D modality, and that the “currency” also forms at that modality as a consequence of the emergence of trade; please see our Post “(P&I) The Process – The 1st Real Dollar” for more details. However, the trading blocs that we have today don’t operate at that level – they are not hand to mouth – but are much closer to the Company E modality at α=1, which is the “bank modality” and suggests competition for “deposits” and the income on them, and the evidence suggests that α≈1.10 which is optimal for the “Profit Box” and provides a small, but systemic, excess of receivables (exports) over payables (imports) which is the “profit” of the trade for those who are successful at it; please see Figure 1.1 below. In Figure 1.1 above, we have shown that the Coase Dividend which is the “balance sheet worth of the trading connections” is a rather large number – for these trading blocs, it’s $577 billion on a current and enduring basis, against a current net trade balance of about $2 trillion, or 28%, and even 34% if it is accumulated over a longer period of time, which it does because it’s a balance sheet number and an asset to the nation simply because it has trade. If we add the Coase Dividend to the country’s “Total Investment” (as defined by the IMF World Economic Outlook Database) which is representative of the country’s “total capital formation” including the fixed assets at cost and the inventories, then we have an estimate of N* which is defined for firms as N* = GW* + “Fixed Assets (at cost)” + “Inventory” where the fixed assets and inventory are usually similar to the accounting definitions if we allow for their purpose which is to support the “production” of the “firm” and in this case, it is the “production” of receivables (exports) and payables (imports) in trade. It’s natural to ask to what extent does trade support the GDP and the savings of the country, and we can define the “Capital Productivity” = 1 + log(GDP*/N*) where GDP* is the “capitalized GDP” measure that we used to calculate GW*, and we are thinking of N*, which is basically the “fixed capital” and the “inventories” for consumption or export, plus the Coase Dividend due to trade, as “supporting” the GDP*; if we omit the fixed capital and the inventories, and consider only GW*, then we have the “Trade Productivity” = 1 + log(GDP*/GW*); please see Figure 2.1 below. The IMF also maintains information on “savings”, which we can think of as our accumulated income net of what we require to live, and there are some places that seem to be really expensive places to live, and we need to wonder where it all comes from, and how will they keep it; please see Figure 2.1 below.